Recent market studies suggest that the new generation of home buyers are totally unaware of the World In Action documentary made in 1983 and are not anti-timber frame. Indeed house builders and timber frame companies are keen to promote the perceived environmental benefits of this method of construction. 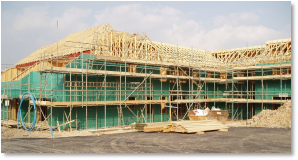 In 2010, one in four new homes is being constructed using timber frame or, to be more accurate timber panel, construction. However, recent catastrophic fires have cast doubt on this method of construction and the beneficial myths of timber frame homes. This website aims to bring independent information for the new home buyer so they can fully consider all issues before buying a timber-frame brand new home. Why do house builders like Timber Frame? How can you tell a timber frame home? Timber frame homes are built using a clad softwood frame for the inner leaf of the cavity wall. The modern timber frame “kits” that arrive on site on the back of a low-loader lorry generally consist of 89 x 38mm or 140 x 38mm CLS (Canadian lumber sizes) treated softwood (Whitewood) timber studs at 600mm centres clad with a 9mm thick oriented strand board (OSB) which looks like a rough type of chipboard and is sometimes referred to as Sterling board. This is covered with breather membrane (commonly blue or green) which is designed to repel any water that penetrates the outer leaf cladding material but is permeable to water vapour escaping from the timber structure. Completed homes constructed using a timber frame can be easily recognised by the mastic-filled 25mm movement gaps under the roof soffits and the 15mm gaps under the window cills. These allow for the frame to shrink (settle) as it dries out. There should also be evidence of a ventilated cavity, which allows the timber frame to breathe. This is normally in the form of plastic weep vents in vertical brick joints at 450mm (every two bricks) at dpc level, either side of each floor and again at eaves level, ventilating the cavity between each of the cavity fire stops. In addition, timber frame homes are sometimes clad with timber boarding, vertical tiling or even rendered plywood. The principle behind timber-framed housing is to provide a very quick construction time. The inner leaf, first floor and roof trusses can be fully erected in 2 or 3 days. With up to 20% fewer labour days on site it provides a faster return on the house builder’s investment and greater potential profits. Timber frame is generally a cheaper method of construction. Less time to build means less cost. However when bricklaying labour is plentiful and demand for new homes low, the cost of masonry construction is very comparable to that of timber frame. Timber frame buildings are lighter than those built in traditional brick and block and therefore do not need expensive, over engineered, designed foundations or require good ground bearing strata. Timber frame systems are particularly suited to brownfield sites with poor soil conditions that can only accommodate lighter buildings unless costly foundation design solutions are used. Note with the exception of energy efficiency, all of the advantages favour the house builder not the new homeowner! 90% of people prefer to live in a home with the characteristics of modern masonry construction - excellent sound insulation, longevity and robustness. 56% of people believe new homes should be built to last and 71% of homeowners believe masonry homes have a longer life span. 69% of homeowners believe that they will achieve a favourable resale value from a home constructed in masonry using modern bricks and blocks and concrete masonry. There is sentimentality for brick among some homebuyers, which may also explain why so many house builders choose to put a brick exterior on timber frame homes. Many people think that modern methods of construction (such as timber and steel frame homes) would probably deliver higher quality housing. But most people have no idea what form of construction has been used for their homes. And unsurprisingly most people don’t really care – if you offer someone a spacious, energy efficient home at an affordable price close to local services, it doesn’t matter how that home is built! To assess the environmental impact of any building material used in the construction of a new home, every aspect must be taken into account. From the initial growing or quarrying, the processing and manufacturing, the delivery and transport to the factory and site right through to the recycling potential of the material at the end of the life of the building. The UK Timber frame association claim that "wood is effectively a carbon- neutral material (even allowing for transport), and timber frame has the lowest CO2 cost of any commercially available building material. For every cubic metre of wood used instead of other building materials, 0.8 tonne of CO2 is saved from the atmosphere. Every timber frame home saves about 4 tonnes of CO2." The Whitewood softwood timber used in the manufacture of the timber stud panels is exported from Canada or Eastern European (Russian) forests. Whilst it is sourced from managed resources, the raw timber will be transported over great distances before it eventually reaches the site. The vast majority of bricks and blocks used in the UK building industry are manufactured in the UK, reducing the carbon footprint caused by transportation. They are produced in local factories providing British jobs and supporting the local economy, using locally sourced raw materials, and, in many cases, using waste by-products from other industries such as ash from coal-fired power stations rather than sending this to landfill. Brick and block is a resilient material and extremely hard-wearing. This means homes built in masonry have a very long life span a 100 years or more. This smoothes the environmental impact of their manufacture over many centuries. When the time does come to replace masonry buildings they can and will be 100% recycled.